NRF brought retail solutions at all levels of the maturity spectrum. Omni-channel solutions are getting quite mature, though much work remains. 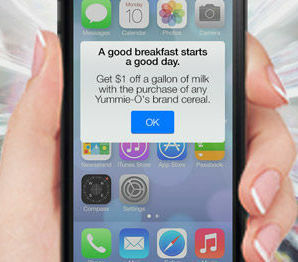 Exciting new developments in Internet-of-Things and mobile commerce abound, but are at early stages. Here's a rundown from NRF. GPShopper is more than just IoT, but locating technologies play a key role in their overall solution. I talked to GPShopper years ago when they were called Slifter and mentioned them in Location-Based Services Poised for Rapid Growth. The original concept was consumers could ask who had a specific product nearby, and Slifter would look in the inventory management systems and commerce systems of participating retailers with nearby stores and provide a list of locations and prices. Retailers loved the idea of providing this service, but wanted it on their own mobile application. So, GPShopper now provides white label mobile shopping systems with that functionality and more. This includes social and loyalty engagement, giving shoppers ways to share pictures and comments on social media. They also have in-store payment capabilities and can leverage Bluetooth beacons. GPShopper is not an ecommerce system itself, but rather a mobile shopping platform that integrates with ecommerce and many other systems to provide functionality inside and outside of the store. Read the entire ChainLink Research report.